Two-time world champion Cristian Mijares scored a well-deserved hard fought 10-round unanimous decision victory over game Nicaraguan Eusebio Osejo last night at El Palenque de la Feria in Aguascalientes, México. Despite his opponent's toughness, Mijares was the more classy and more effective fighter displaying the trademark moves and attacks that made him a durable super flyweight world champion for years. The Mexican's dominance was reflected in the official scores of 97-92 in the three cards, all in favor of the former champion born in Gomez Palacio, Durango. The still very popular Mijares, currently rated #11 super bantamweight, reaffirmed his willingness to challenge any of the 122 or 126 pounds world champs. "I want go for world title shot. I'm ready in all respects. 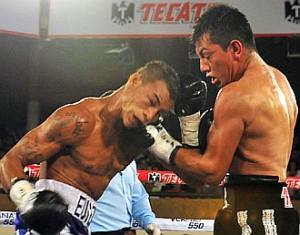 I have asked Zanfer (Mijares's promotion company) to secure for me a world title fight against any of the super bantamweight or Featherweight world champions," said the 30-year-old Mijares after his victory. “Ya quiero ir por un título mundial, estamos listos en todos los aspectos, le he pedido a Zanfer que me consigan ese combate ante el campeón que sea en Supergallo o Pluma”. Mijares's victory was broadcast live on TV Azteca 7 La Casa del Boxeo. Photo: Mijares (R) scores on Osejo in Aguacalientes.